Jean Anderson is one of our favorite cookbook authors. Her From a Southern Oven in 2012 is a staple for us. We’ve tried with delight recipes like her Peppery Cheese Rounds and her Open-Face Vidalia Pie. I cannot urge you strongly enough to find and enjoy her books. Here’s another reason, also in From a Southern Oven. 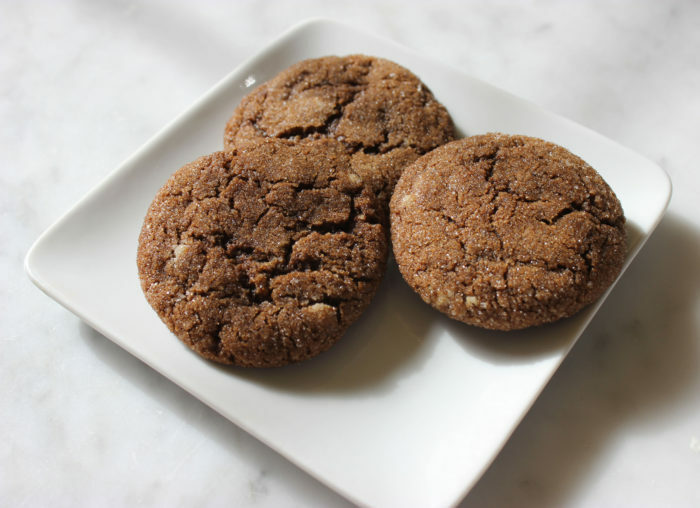 You’ve had molasses cookies through your life. Big and small, hard and soft. Here is the Goldilock’s recipe: just right. The right size, the right texture. Part of the secret here is to make the dough then refrigerate it overnight. I know, you want the cookies now. Patience in this case is worth the wait. Sift flour, baking soda, salt, and spices into a large bowl and set aside. Combine 1 cup sugar, butter, molasses, and egg in second large bowl, then mix in sifted dry ingredients about 1 cup at a time to make a stiff dough. Cover and refrigerate overnight. When ready to proceed, preheat oven to 375°F. Also, spritz several baking sheets with nonstick cooking spray and set aside. Working with a small amount of chilled dough at a time, shape into 1-inch balls. Roll each in remaining ¼ cup sugar to coat, then space about 2 inches apart on baking sheets. Slide onto middle oven shelf and bake 10 minutes until crinkly on top and irresistible smelling. Note: For crisper cookies, bake about 2 minutes more. Remove from oven and cool 2 minutes on baking sheets before transferring to wire racks. Cool to room temperature, then store in airtight canisters.